One gallon for $62.90 plus shipping, For multiple gallon orders FedEx is usually the best choice. 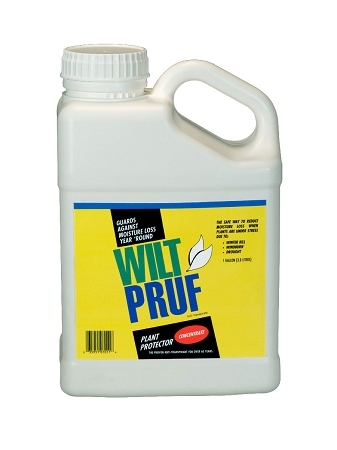 Wilt Pruf one-gallon concentrate is the perfect solution for protecting your home's plants and shrubbery all year long. A single gallon of the product makes from 5-10 gallons once diluted. The specially-formulated blend of chemicals works to keep Evergreens including Rhododendrons, Azaleas, Arborvitae, Hollies, Boxwoods and Laurels looking pristine when under high water stress by keeping moisture loss in foliage to a minimum. 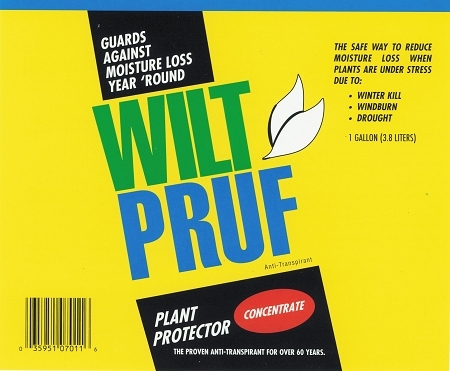 Wilt Pruf concentrate 1-Gallon, dilute before use, makes 5-10 gallons of solution. Usually ships in 24-48 hrs. via USPS or FedEx, add to Cart and enter your zip code to view shipping options/costs (For single Gallon orders in many cases the Gallon Delivered product may be more economical - total cost including shipping or $72.75). Protects valuable evergreen shrubs including Rhododendrons, Azaleas, Arborvitae, Hollies, Boxwood, Laurel, and many other ornamentals when under water stress - by reducing moisture loss through foliage. The best product for protection of greenery --- fresh and cut! Here on the Outer Banks of North Carolina, the winter winds howl throughout the season. 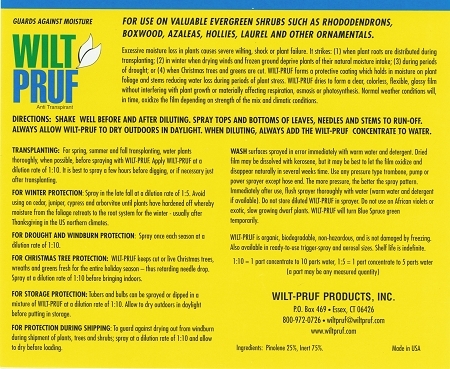 Wilt Pruf works wonders at protecting the beauty of a wide variety of evergreens --- a single application in late November/early December gets us through the entire winter! My primary use, however, is for the protection of cut greens used in my Christmas business. I apply Wilt Pruf to all completed wreaths and table pieces. I have many customers remark that they feel sorry to throw their Christmas wreaths away in February since they still look so good! Couldn't work with out it! And the gallon concentrate is definitely the best value around! Just ordered and received product-shipped and received in prompt order. My landscaper touted the product and I am anxious to see it work this winter to protect my new Skip Laurels-wish I had known about this last winter-brutal and would have save some new plantings. Called with a question and received a fast answer.